ICC T20 World Cup 2014 is going to start from 16th March 2014 In Bangladesh in which for the first time 16 teams will be taking part. we will be seeing many Interesting matches from 16th March to 6th April 2014 but one match for which everyone is waiting with massive excitement is Pakistan Vs India. Pakistan and India the two historic rivals will face each other on Friday 21st March in Shere Bangla National Stadium, Mirpur in Important T20 match. recently Pakistan defeated India in Asia Cup ODI match on 2nd March due to Impressive batting of Shahid Khan Afridi. India would now be looking to equal the score while Pakistan would be looking to gain another victory over India to make their fans happy back at home. this is a different type of game from ODI and now M.S Dhoni will be back In Indian side so Indian team would be more strong this time against Pakistan. Pakistan also got many awesome T20 players who can destroy any team of the world. the advantage for Pakistan is that Shahid Khan Afridi is also in very good batting form which he showed in matches against India and Bangladesh in Asia Cup. Yuvraj Singh is also back In Indian side so a lot will depend on how he bats and bowl. 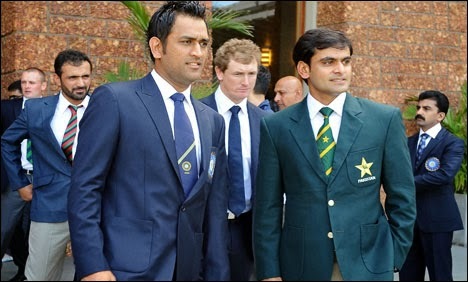 for Pakistan Shoaib Malik, Sohail Tanvir and Kamran Akmal are back and all these three players got good record against India. so we can expect a Interesting competition In T20 World cup 2014 between these two sides.